The American Museum of Natural History is one of New York City's most popular attractions, featuring four floors filled with exhibits on natural history topics, from dinosaurs and mammals to biodiversity and outer space. Use these tips and tricks to make the most of a visit to the American Museum of Natural History. The AMNH Explorer app makes it easy to find exhibits, bathrooms, and the museum shop. Also, includes information about tours and treasure hunts (especially great for kids). The app is a free download for visitors with an iPhone, iPad, or iPod touch, and the museum has devices that you can borrow, for free, if you don't have a compatible phone. The American Museum of Natural History has exhibits on 4 different floors and several staircases and elevators...so you're sure to get lost without a map. You can get a map for free when you purchase your admission tickets, or from any information booth in the museum. The staff can be very helpful if you feel disoriented and need directions. For a small fee, you can check outerwear, umbrellas, and bags at the coat check in the Rose Center or Theodore Roosevelt Rotunda. This will ensure you can maximize time in the museum without overheating or having your hands full the whole time. It would be impossible to see every exhibit in the museum in one visit. Check your map, look at a list of recommended exhibits, and plan for which things you'd most like to see. If it's your first time in the American Museum of Natural History, take a Highlights Tour offered hourly from 10:15 a.m. to 3:15 p.m. This hour tour hits the museum's top exhibits, and narrows which halls you'd like to revisit and explore more closely. If you're a repeat visitor, check out the Spotlight Tour schedule once you arrive at the museum. The Rose Center has an audio tour, as well. All tours are free with museum admission to groups of less than 10 people. In addition to breathtaking visuals, IMAX films and Space Shows are a great way to get off your feet in between exhibits. The films last about 40 minutes, and most are appealing to both children and adults. To ensure you get the best seats, get to the theater 15 minutes before showtime. This provides time if you get lost. If you need another rest, the museum offers several food options, and don't forget the hot dog and pretzel vendors outside of the museum. On a nice day, refuel on the museum steps and enjoy great people watching at the same time. If the weather outside is less pleasant, the cafes in the museum offer a welcome respite. 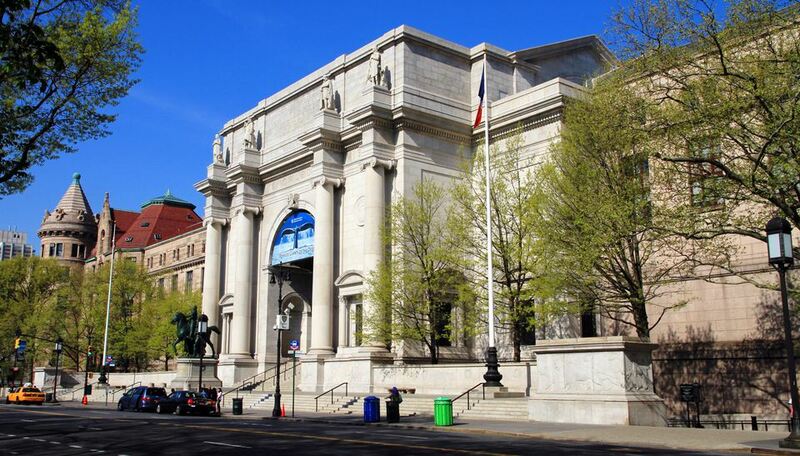 The American Museum of Natural History has frequently changing exhibitions that offer deeper insight into some of the museum's many popular topics. Purchase tickets to special exhibitions when you enter the museum. The American Museum of Natural History has several shops, including ones dedicated specifically to special exhibitions. These shops have tons of items that make great souvenirs and gifts in all price ranges.